Less than 2 weeks until I leave for the Philippines. So crazy! I have to start packing next week & then I will just have last minute stuff to throw in my suitcase the night before I leave. I already have some stuff that I'm taking already in my suitcases, it's just not organized & I don't have any of my clothes packed yet. I think F.B. & I are going to do what we did last year for my Thanksgiving. (Since it's an American holiday.) We'll have dinner at Gerry's Grill, go to Trinoma Mall, pick out some Martinelli's Sparkling Apple Cider, get some mashed potatoes from KFC & watch a movie at his house. Hehe. I think we're also going to get our I.D. Photos taken at the mall when we go out, we will need them when we apply for our marriage license. We'll have to wait until probably November 30th to go to the USA Embassy to get my 'Certificate of Legal Capacity to Contract Marriage' because the US Embassy in Manila will be closed on Thanksgiving. Unless we go on November 27th. I'm not sure yet. I know the week of the 30th we will be applying for the marriage licence, because there's a 10 day waiting period & we may or may not have to take premarital classes. Today I did some baking. 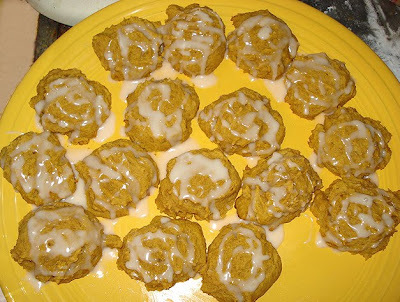 I love baking Pumpkin Bread, etc around Thanksgiving and Christmas. 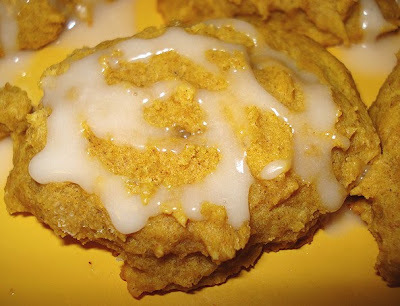 This year I tried baking Iced Pumpkin Cookies! I found the original recipe here, but I altered it a bit. I left out the chocolate chips (didn't have any!) and the walnuts (I don't like them.) And since I didn't have Pumpkin Pie spice handy, I put in a 1 tsp of cinnamon & a 1/2 tsp of nutmeg. Directions: Preheat oven to 375 F. Grease baking sheets. Mix wet ingredients together and dry ingredients together in separate bowls, before combining & mixing well. Drop by rounded tablespoon onto prepared baking sheets. Bake for 15-20 minutes or until edges are lightly browned. Cool on baking sheets for 2 minutes; remove to wire racks to cool completely. Spread or drizzle with vanilla glaze. Yum! They turned out well! I put the icing in the fridge to firm up a little while the cookies were still baking.